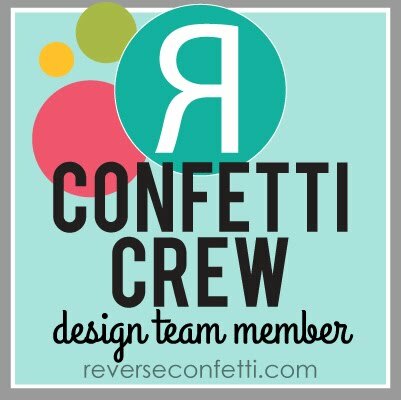 Well, it's that time again for another awesome stamp and die release from REVERSE CONFETTI!! With summer kicking into high gear, we've got lots of new goodies that will surely make a splash in your crafty collection. Today is Day One of our sneak peeks of 4 new stamp sets and 7 new Confetti Cuts, along with the latest Quick Card Panel set, BY THE SEA. 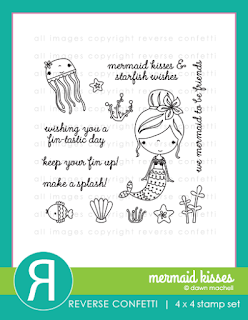 Our two featured stamp sets today are called MERMAID KISSES and SEASIDE. I can't decide which one I like more! I was so happy that Jen was getting this sweet mermaid stamp set for RC. I think we've needed a cute friend like her for a long time and what better timing than summer! 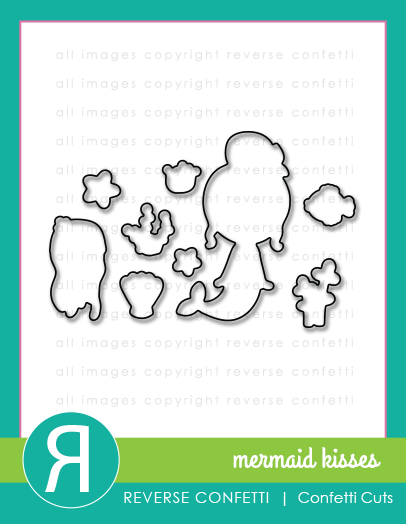 MERMAID KISSES also has its own coordinating dies, MERMAID KISSES CONFETTI CUTS. Ok, so are y'all checking out that fun piece covering the front of the card? 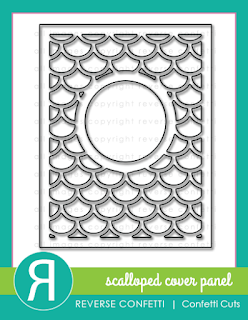 It's the new SCALLOPED COVER PANEL. 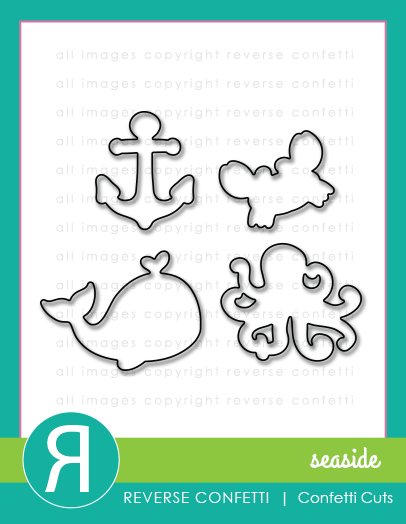 It's really perfect for some of the nautical themed products we have coming with this release. 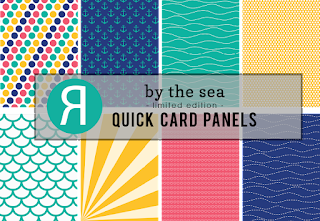 I used one of the new BY THE SEA Quick Card Panels to fill in the center circle, and then also cut some of it with a portion of the cover panel to make the navy scallop pieces that I used to fill in some of the sections. The cover panel really makes cardmaking fast and easy! My next sample are some tags I made and attached to some cute paper bags that I found at Target (they have a bunch of nautical themed stuff in their discount section formerly known as the dollar spot). I used the SEASIDE stamp set which also has coordinating SEASIDE CONFETTI CUTS. 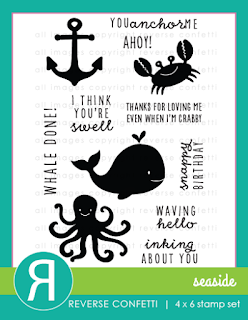 The stamp set includes some cute critters from the ocean that stamp off great and are a perfect size for tags, cards or scrapbook pages. 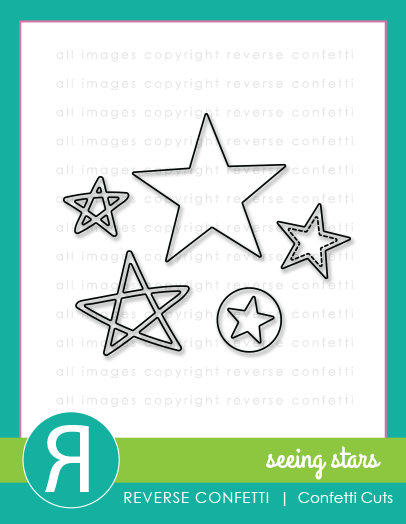 I've used some other new things on those tags--there's a new set of dies, SEEING STARS Confetti Cuts and I'm so excited to have them as well, especially these that look "hand drawn". So they were so cute just tucked in as an extra element on my tags. 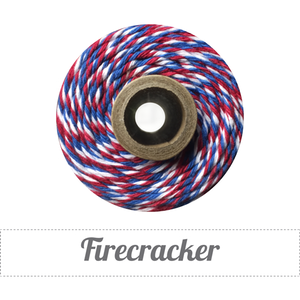 We've also got some new twine that is aptly named Firecracker with the red, white and blue. Simply tied onto the clips and added to the bag, attaching the tags, are quick and still make an impact on this sweet giftie! Ok, that's about all from me today! Come visit me again tomorrow! We have lots more sneak peeks to share over the next 2 days. Then, everything will be available on the 8th. 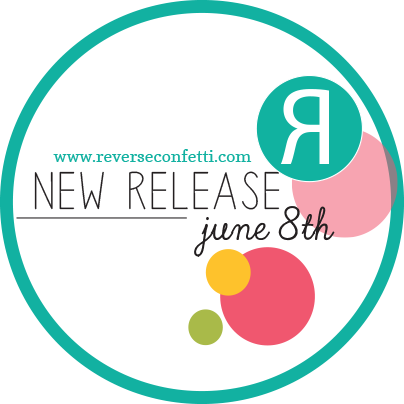 Don't forget that Jen has a link list going daily (JUNE 5-8) for all the sneak peeks over on the REVERSE CONFETTI blog HERE. Love your fun mermaid card and yes to your cute bags! Love them! Love the sweet mermaid and in the bright colors against the cool aqua scallops! Cute tags for any gift or on a card! both of these are adorbs, Susan! love all the pretty RC details you added. Susan, these are precious!! Love summer and the beach!!! Such sweet projects! Love the treat bags and tags! Gorgeous mermaid card! Cute tags too! Love both projects, especially the tags on the bags!! This is such a fun release!! SQUEAL!! Susan I LOVE LOVE LOVE these!! =) LOVE the way you inlaid the Pattern Paper in the Background Die and Those Bags are SO FUN!! I CAN'T WAIT to see MORE!! Have a FABULOUS RELEASE WEEK!! HUGS!! Such cuteness, love how you used the QCP on your first card, very creative!!! Your projects are just gorgeous and so creative!! So excited about this month's release :)! 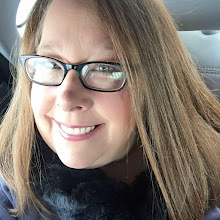 Love, love love your use of bold colors with these awesome products. All adorable, like always :), but I especially love your mermaid (and that sentiment). So sweet! Your Mermaid and sentiment so put a smile on my face. I'm still smiling and can't stop! I love the layout and the coloring. YOU did not disappoint! Great job. 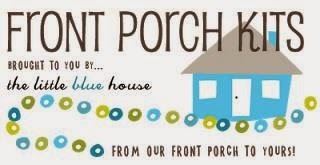 Love your projects - they make me feel "summery." The scalloped die panel is giving me so many ideas!! Susie, such great projects! I love the color combo and all the little details on your mermaid card! The bags are perfect summer party favors, love this idea. Thanks for sharing and inspiring. All of your cards are amazing today, but the color in the mermaid is spectacular! LOVE this design! Cute cards! I love the scalloped background! Thank you for the inspiration and for the opportunity to win! Darling card and tags! Love how your background turned out with the Scalloped Cover Panel! Great projects. Love the two colored layers and the adorable mermaid. So fun. Cute cards and tags. Loving what I see so far. Hopefully I am a winner this time. Lovely designed card and adorable bags - so cute!!! Love the bag tags, they are fun! The mermaid card is my favorite! I love how you colored the images, and the way you created the sun is fabulous. Susan, I sure hope we make the Lil' Miss Mermaid card in class! Your coloring of her is so beautiful and I love the way you used the scalloped cover panel! Of course,the sweet little bags are so cute for giving someone a cookie! Love all the stamps and dies this release!!!! I thought I only wanted the scallop cover panel but now I may need more! What adorable creations!! I LOVE the fun tags!! Love your card...so many neat elements. THe little tags are cute too. Your card is so cute.I like the way the QCP are peeking out from behind the cover die. And what a cute idea to put those tags on the bags. Great thinking! Love the mermaid card and the hints of navy! Cute! Cute!! Cute!!! Card and tags so absolutely CUTE!!!! Love the nautical tags, they are adorable! 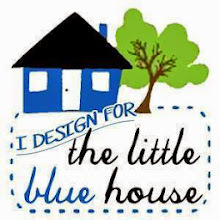 Your projects are adorable! I like the different colored inlay on the die. Just love your projects in nautical colors! Susan, These are awesome cards as usual! Love the new twine too! Perfect for the seaside designs! This is such a lovely collection and the backgrounds are really great. This is sucha lovely collection and backgrounds are really great. Teether love your fins! Cute tags, too! Teether???!!! That was supposed to say "Really"! Lol!!! haha fin... I see what you did there! Like the Nautical theme & Mermaid creations. Have a Bee-utiful day!